Featuring Avalon Luxury River Cruising. One of a kind Panorama Suites SM and Open Air Balcony'sSM . .IF YOU WANT TO SEE THE WORLD, cruise down its legendary rivers. If you want to see more of the world, look no further than Avalon Waterways. Our Suite Ships® feature one-of-a-kind Panorama Suites,(sm) with the widest opening windows in river cruising, the industry's only Open-Air Balcony,<sm> and beds facing the incredible views. Avalon, the company that reinvented river cruise ships with spacious rooms, huge windows, one-of-a-kind open Air Balconies, and beds that face the ever-changing views outside—just reinvented the river cruise experience. Now, your clients can choose three different ways to enjoy their destination, with our Classic, Discovery, and Active Avalon Choice® included excursions. Avalon has made it possible for them to cruise their way. †Featured prices are per person, in Canadian dollars, land/cruise or cruise only, based on double occupancy, cabin Cat. E or D (as specified above), departure dates as indicated (the lowest price available to book), include applicable taxes and port charges. International air and travel insurance are additional-general application..
Avalon offers several other promotions for cruises that are not specified in the FLY FREE Offers. 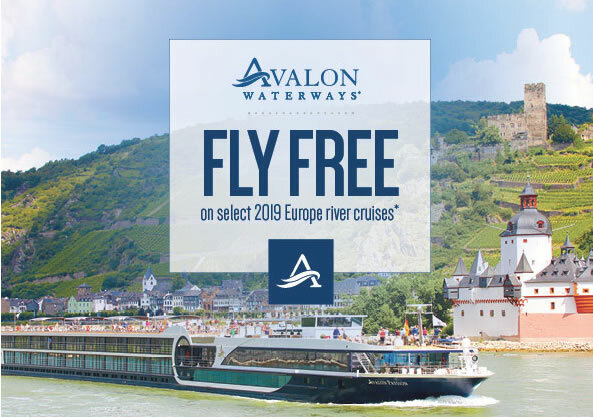 Call or email if your River Cruise itinerary and departure is not in the FLY FREE selections. • All offers , bonus features, savings, discounts , credits are subject to change without notice. They are subject to withdrawl without notice, They may not be available on all departures, They are subject to space being available. E. & O. E.
*Terms and Conditions: Prices are based on lowest available cabin category or cabin category described and are were available at advertising deadline. Availability by cabin category, can change daily. Prices based on per person twin share in CAD, are strictly limited & subject to availability on specific dates, until sold out. Offers for new bookings only and not in conjunction with any other offers and may be withdrawn at any time. Offers based on twin share in CAD, are strictly limited and subject to availability until sold out. Port charges and areincluded. Contact Us - We may have a group discount rate in addition to the low pre and post tour add ons! name , your email, cell phone, detailed information request. IMPORTANT- There are over 50 countries that require that your passport be valid for at least 6 month after arrival. Please check with each country visiting. Helpful link. Go to www.voyage.gc.ca for more information on these advisories or call 1-800-267-6788 in Canada and United States. The majority of Tour companies require all passengers have a passport that is valid for 6 months after the return travel date. To make reservations this will be a requirement. (The Travel Mart Ltd, is an indepentant travel agency and is in no way associated with Avalon Waterways© and Globus Voyagers© ! ). Travelmart Home. . e-mail Travelmart.ca. . 7 Reasons to Book. . Privacy Statement. .